Manager Billy Heath said his team’s attitude was spot-on after FC Halifax Town beat Ashton United 5-0 in the second qualifying round of the FA Cup. Tom Denton, Danny Hone, Jordan Sinnott, Alex Simmons and Richard Peniket scored as The Shaymen eased through against a team three divisons below them, a result Heath believed was built on Halifax’s approach to the clash. He said: “The main thing when you come to smaller teams is to give them they respect they deserve, and we did that. “I thought we controlled the game from start to finish but I was just pleased with the way the lads approached it. “You can struggle in games like this because you go in with the wrong attitude, but the attitude was really good. 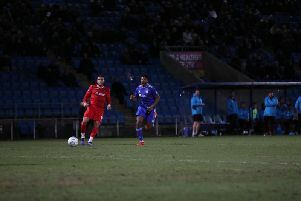 Heath said Denton’s second-minute goal was crucial in dampening Ashton’s hopes of an upset. “It’s always good to get an early goal. You expect Ashton to come out flying at you but I think it just knocked the stuffing out of them,” he said. “We’ve done what we needed to do today. We played some good stuff, scored goals. “But the attitude of the players was key. Heath kept faith with Denton despite him going five games without a goal before Saturday’s win. “I said to him just keep getting in the right areas,” he said. “He could have had two or three against Gainsborough, but Tom will score goals over time if you put the right deliveries in. “Whatever level he’s playing at, he’ll score goals. Lincoln loanee Alex Simmons scored his second goal in as many games, and Heath is pleased with his newest recruit. “I came across him a couple of years ago and he was bright and sharp. “We played against him in the FA Cup. “He’s a good lad that wants to do well and wants to learn. “It’s not really his position playing on the left in a 4-4-2 but it’s about him getting some football. Jordan Burrow remains without a goal this season, and missed chances to open his account after coming off the bench at Ashton. “He’s just frustrated at the minute with the minutes he’s getting on the pitch and he can’t seem to buy a goal,” Heath added. “I said to him that he’s just got to keep going. “It just seems to not be falling for him but he may start next week. He’s just got to play his way out of this.